Hurry up, download Bengali Year Book 2018 full pdf from our website. All Bengali Current affairs book pdf available on our site. Current affairs are the most important for the topic for any kind of Competitive Examination like, ssc, wbssc, wbcs, psc, msc, rail, upsc, bank, police, etc. 2018 Bengali current affairs book pdf available here. You can, also download study materials of any kind of Competitive Exams. 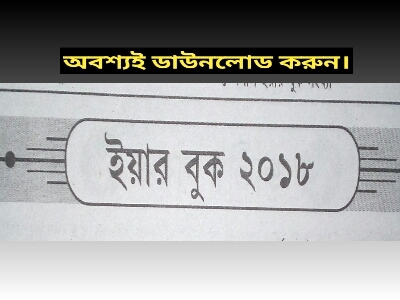 Today GK Solve share Bengali Yearbook 2018 full pdf download link. Details of pdf book and download link are given below. This pdf book's credit goes to Sikha, Chakri O khela Paper. In this pdf, you can get all current affairs, facts in 2017. This most important pdf book for you. Download this book as soon as possible and read carefully. This Bengali Year Book 2018 pdf book makes your practice better. Hope This book is really helpful to you.